A fluid, well-paced story that will leave you thinking in a more enlightened way about race in America. Hair is a topic that runs through this book about a Nigerian woman who never thought about being black until she came to the U.S. It starts off in a hair salon and then goes back and forth in time and place - but in a very followable way. This book is about race, but more than that, it's a good novel as much about love and relationships as anything else. Chimamanda Ngozi Adichie grew up in Nigeria. Her work has been translated into thirty languages and has appeared in various publications, including The New Yorker, Granta, The O. Henry Prize Stories, the Financial Times, and Zoetrope: All-Story. 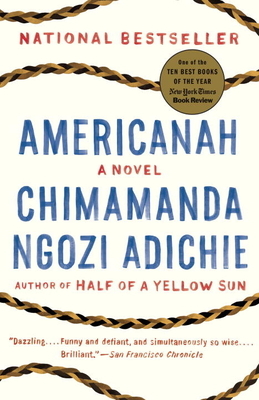 She is the author of the novels Purple Hibiscus, which won the Commonwealth Writers’ Prize and the Hurston/ Wright Legacy Award; Half of a Yellow Sun, which won the Orange Prize and was a National Book Critics Circle Award finalist, a New York Times Notable Book, and a People and Black Issues Book Review Best Book of the Year; Americanah, which won the National Book Critics Circle Award and was a New York Times, Washington Post, Chicago Tribune, and Entertainment Weekly Best Book of the Year; the story collection The Thing Around Your Neck; and the essays We Should All Be Feminists and Dear Ijeawele, or A Feminist Manifesto in Fifteen Suggestions. A recipient of a MacArthur Fellowship, she divides her time between the United States and Nigeria.